The Avg. Group Saves 17.8%! 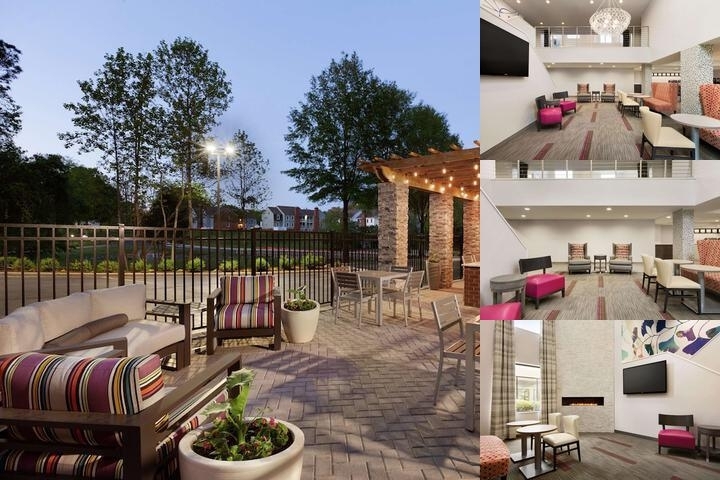 Homewood Suites by Hilton is an upscale, yet casual, all-suite residential-style hotel brand catering to travelers seeking a homelike hotel experience for a few days or more when on the road. The extra space and privacy of the suites, the casual atmosphere, and the many homelike amenities and services ensure guests satisfy their individual need for comfort, flexibility and convenience. All at the price of a high-quality, traditional hotel.Our suites offer a separate living room with sofa bed, TV & DVD player, fully equipped kitchen with stove-top, full-size refrigerator, microwave, dishwasher and complete set of dishes & cookware. Every morning, we serve complimentary Suite-Start Hot Breakfast, served buffet style in our lodge area. Every Monday-Thursday from 5pm-7pm, guests can unwind with our complimentary Welcome Home Reception, featuring a daily rotation of refreshments and light fare. Free high speed internet access is available everywhere in the hotel. Guests can also enjoy our indoor pool, fitness room, picnic area with barbeque grills, 24-hour suite shop and complimentary grocery shopping service.School Groups that don't include an adult in each room may require overnight security at $24 per hour. Baggage Handling is available on request and is $4.00 per person round trip. Indoor pool open year round. Williamsburg / Newport News Airport is 15 miles / half an hour. Norfolk & Richmond Airports are 50 minutes traveling time respectively. taxi expense varies on number of passengers. Free Hot Buffet Breakfast is included. Start your day off right with free hot breakfast buffet with hot items such as eggs, pancakes, French toast, waffles and breakfast meats, as well as cereal selections, bakery items, fresh fruit, yoghurt, hot oatmeal tea, coffee and a selection of juices. 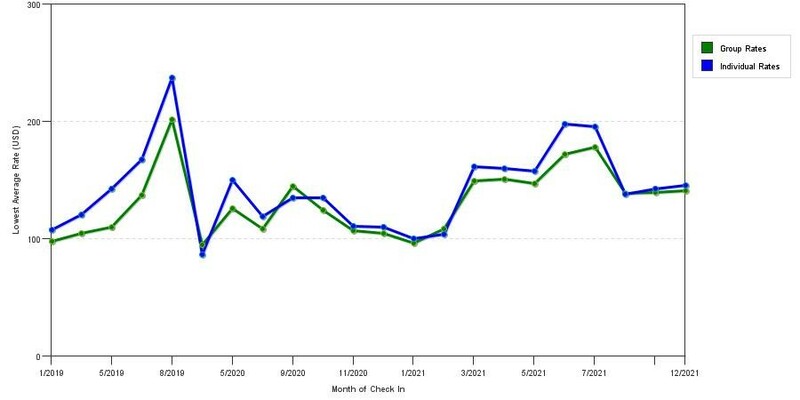 Above shows seasonality of room prices for both group/meeting rates and the lowest individual traveler rates our rate checker could find at the time the group/meeting offer was placed. The most competitive group rate shown is 36.6% in September 2018 and the highest average individual rate is $251 in the month of July 2019. This chart will show past seasonality and also project future months. If you are flexible with dates, you may want to consider staying at Homewood Suites by Hilton in a month when rates are lower. Below are the meeting, banquet, conference and event spaces at Homewood Suites by Hilton. Feel free to use the Homewood Suites by Hilton meeting space capacities chart below to help in your event planning. Hotel Planner specializes in Williamsburg event planning for sleeping rooms and meeting space for corporate events, weddings, parties, conventions, negotiated rates and trade shows. The Jefferson Room is perfect for business meetings, social events, retreats & casual gatherings. 47 x 18 x 7 Ft.